Cape Kamenjak is a wonderful nature park located on the Premantura peninsula on the southern tip of Istria. Close to Pula as well as some of the other resort towns in the area, the park is an excellent and relaxing way to spend a day and is highly recommended. With an unusual landscape, miles of rugged coastline and beaches to enjoy, coves and caves to explore, a quirky ‘safari bar’ and even some animals to (hopefully!) see, it’s definitely worth an outing. If you have your own set of wheels, then there’s no problem! Once you head towards the southern tip of Istria, Cape Kamenjak is reasonably well signposted. You’ll probably also notice a good line of cars heading there too – and certainly when you come to a stationary queue, you know you’ve found the entrance. Don’t worry, the queue does keep moving pretty well although the entrance can be quite busy in the peak summer months. It costs 35 Kunas to enter the Park by car (other prices apply for other vehicles). It is free for pedestrians. In terms of parking, you can only park your car at specific spots – but simply drive to the area of the park you’d like to head to and park alongside the other cars there. Do also adhere to the rules of driving in the park (i.e. don’t go off road)…as well as the general rules of park conduct such as no camping or lighting of fires. If you’re heading there by public transport, you’ll most likely have to get a local bus to Prematura and than walk from there. There’s a direct bus from Pula; ask locally if you’re trying to reach the park from elsewhere. However, the walk from Premantura is a few kilometers, so this isn’t the easiest way of getting to the park. It’s possible to join a bike tour of Cape Kamjenak from Pula if you’d like to combine exploring the park with a bit of activity. In a word…explore! Well, first head to the sea and then explore! Of course, you will have brought your swimmies, towels and other sea gear (snorkels would be a great thing to bring), so simply head to the rocks or a pebble beach to set up your site for the day. Although lying out on the ‘rocks’ doesn’t sound particularly comfortable, the unique landscape down to the sea is pretty spectacular and you will get a stunning viewpoint of the gorgeous and wonderfully clear sea wherever you base yourself. The rocky terrain also means that there’s little caves in many places to swim into to see what’s there. (Normally nothing, but hey – it’s still fun to do!) And some visitors delight in throwing themselves off the rocks into the sea…perhaps that’s for the braver amongst you. You may be lucky enough to see dolphins and Mediterranean monk seals off the coast; otherwise you might have to make do with fish and small crabs in the sea as you swim…which still entertains swimmers of all ages! But besides a few hours spent splashing about in the water and sunbathing, there’s also other things to do in Cape Kamenjak. The park features some fossilised dinosaur footprints, and there’s a small dinosaur ‘path’ with models in tribute. There’s also an agrotourism location featuring farm animals. For the more active amongst you, if you bring along your own set of two wheels the park is an excellent cycling location. There are also windsurfing opportunities – if you’re interested, check out Windsurf Station for course details; they also do kayak rental. The nature park is ideal for bringing your own picnic (but do please take your rubbish home with you) although there are eating options inside, so don’t worry if you haven’t brought your own food – you won’t go hungry. In actual fact, it would be a real shame to miss out on the beach bars even if you have your own nibbles! Absolutely best of the bunch is the Safari Bar (see above) near the southern part of the park. For a bit of fun first, climb the rickety ladder to the lookout platform to check out the view. 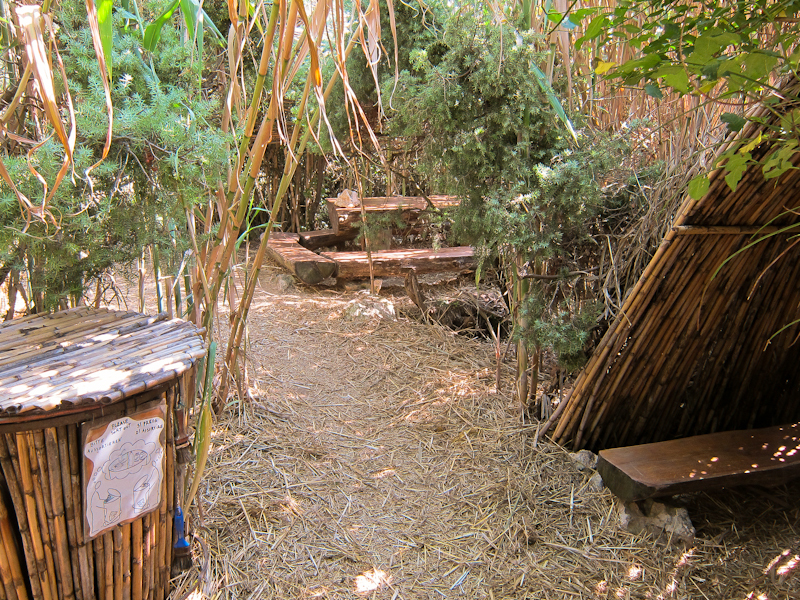 Then dive into the bushes and bamboo reeds to find the actual heart of the bar – they serve very tasty snacks (nothing goes down better than a cevapcici bun or a plate of sardines) and drinks – and find a table in amongst the overgrowth or in one of the ‘huts’. With an amazingly relaxed vibe and some quirky playground toys for the kids, it wouldn’t be a surprise if you choose to spend a few hours here too. There are also designated grill/barbecue points in the park if you fancy ‘cooking’ your own meal. Check out the official Cape Kamenjak Nature Park website.